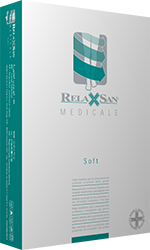 Latest line of graduated compression therapeutic stockings made of cotton, with a natural feel against the skin and extremely soft thanks to the high quality cotton yarns used for its manufacturing. This line is produced in the Ccl I-II compression Classes. Knee-high with reinforced toes and heel. Elastic, soft and comfortable. Opaque, durable for lasting use and very comfortable, thanks to the use of natural cotton. Very high quality manufacturing and finish, the seams are flat so as to be invisible and comfortable. Stockings with reinforced toes and heel. Dots silicone lace to ensure an excellent grip and a good skin transpiration. Hypoallergenic silicone. Opaque, durable for lasting use and very comfortable, thanks to the use of natural cotton. Very high quality manufacturing. Tights with reinforced toes and heel. Soft and comfortable elastic waist band. Opaque, durable for lasting use and very comfortable, thanks to the use of natural cotton. Very high quality manufacturing and finish, the seams are flat so as to be invisible and comfortable. Maternity tights with reinforced toes and heel. Elastic and soft waist band, to be very comfortable. Opaque, durable for lasting use and very comfortable. Very high quality manufacturing and finish, the seams are flat so as to be invisible and comfortable. 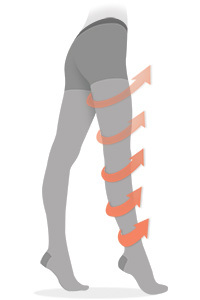 Indicated for the prophylaxis of venous diseases in risk patients, tired and heavy sensation in the legs, appearance of varicose veins during pregnancy, thrombosis and embolism. For slight chronic venous insufficiency, thrombophlebitis (superficial thrombosis) with and without edema, post-sclerotherapy, after selective out-patient treatment of varices and stripping, varicose veins during pregnancy, prophylaxis of thrombosis and embolism. 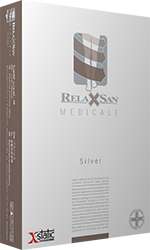 Specially designed for advanced phases of chronic venous insufficiency, after recovery from crural ulcer (prophylaxis of relapse), posttraumatic edema, and reversible lymphedemas. 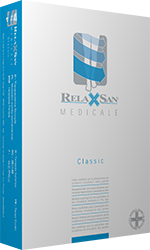 Classic line of therapeutic graduated compression stockings, most resistant with refined knitting and accuracy of details. Manufactured using advanced technologies and soft microfiber yarn for comfortable and soft products. Excellent finish quality. Produced with X-Static silver yarn. These garments are antistatic, antibacterial, thermoregulator, antiodor, and therapeutic. Specifically designed to prevent thromboemblic prophylaxis and for clinical and hospital use before, during and after surgical intervention.